Various vaccine therapies for Alzheimer's disease (AD) have been investigated. Here we report transgenic rice expressing amyloid β-peptide (Aβ). The Aβ42 gene fused with a green fluorescent protein gene was introduced into rice using the Agrobacterium method. When transgenic brown rice expressing Aβ was orally administered to mice, serum anti-Aβ antibody titers were elevated. The same results were observed when mice were fed boiled, transgenic brown rice. The results indicate that an edible vaccine against AD using rice may be feasible. A vaccine derived from rice would be far cheaper than existing medical vaccines. Alzheimer's disease (AD) causes cognitive impairment and while symptomatic therapies such as donepezil hydrochloride are available, no existing therapeutic medication offers complete recovery from AD. The development of new AD therapies would lessen the social and economic burden of the disease. The onset of AD is thought to be due to amyloid β-peptide (Aβ) deposition in the cerebral cortex [1,2]. As Aβ is a protein, vaccines for AD are potential means of therapy or prevention [3-5]. In trials using mouse models of AD, injection with Aβ as an antigen reduced the level of Aβ accumulation in the brain notably, reduced memory defects and improved behavioral disorders [6,7]. A phase I clinical trial of vaccine therapy by intramuscular injection of Aβ was completed without problems but the phase II clinical trial was terminated because some patients developed meningoencephalitis . In a 6-year follow-up of patients in the trial of AD immunization , cortical Aβ loads were lower in immunized patients compared to the control group. Patients with higher antibody responses had more extensive Aβ removal. However, this study did not find survival or time to severe dementia improved in immunized patients versus the control group. A vaccine therapy with no side effects is needed. Oral or other mucosal vaccinations appear to have fewer side effects than vaccines administered by injection [10,11]. A potential method of oral vaccination is to express a target protein in an edible plant. Increased serum anti-Aβ antibody titer and suppressed Aβ deposition in the brain were observed when green pepper or potato containing Aβ was fed to a mouse model of AD [11,12,13,14]. Edible vaccine might also be produced in genetically modified food plants such as rice or soybeans that accumulate Aβ in seeds. Cereal seeds are better suited for edible vaccines than fruit or vegetables as many have high protein content and can be stored for long periods at room temperature. In the present study, we introduced the Aβ gene conjugated with green fluorescent protein (GFP) into rice, and orally administered modified rice to mice in order to investigate the effects of Aβ on serum anti-Aβ antibody titer. Oryza sativa L. cultivar Hayayuki (Japonica rice in Japan) was used in this study. Mature seeds (brown rice) were sterilized in 70% ethanol for 10 s and 1% sodium hypochlorite for 15 min, and rinsed in sterile distilled water. Seeds were placed on N6D medium [15,16] for callus formation. Cultures were incubated at 25ºC under a 16-h photoperiod using cool-white fluorescent light at 40 μmol/m2/s. Calli were isolated from seed scutella 10-30 days later, and used for Aβ gene induction. The nucleoside sequence coding Aβ42 was amplified by PCR using primers Aβ-5'-XhoI (5'-GAAGTCTCGAGTGATGCAGAAT-3') and Aβ-3'-HindIII (5'-GAACGAAGCTTTTACGCTATGACA-3'). The gene for the APP695 protein was used as a template. The product was digested with XhoI and HindIII, and inserted into pEGFP-C2 (Clontech) at restriction sites resulting in pEGFP-Aβ-C2. The nucleoside sequence coding sGFP(S65T)  was amplified by PCR using primers sGFP-5'-AgeI (5'-ATACCGGTCGCCACCATGGTGAGCAAGGGCGAG-3') and sGFP-3'-BglII (5'-TCAGATCTGAGTCCGGCCGGACTTGTACAGCTCGTCCAA-3'). The product was digested with AgeI and BglII, and ligated to the pEGFP-Aβ-C2 at the restriction sites to produce psGFP-Aβ-C2. The GFP-Aβ fused gene was produced by amplifying psGFP-Aβ-C2 by PCR using primers sGFP-5'-XbaI (5'-TTTCTAGAATGGTGAGCAAGGGCGAGGAG-3') and Aβ-3'-SacII (5'-TTGAGCTCGACTGCAGAATTCGAAGCTT-3'), followed by digestion with XbaI and SacII. The binary vector pIG121-Hm  was digested with XbaI and SacII to remove the Intron-Gus gene. The GFP-Aβ fused gene was then ligated to pIG121-Hm to produce pIG121-Hm (sGFP+Aβ). The binary vector pIG121-Hm (sGFP+Aβ) was electroporated into Agrobacterium tumefaciens strain EHA101 using an Escherichia coli pulser (Bio-Rad). Transformants EHA101 (pIG121-Hm (sGFP+Aβ)) were selected on LB medium containing 50 mg/L kanamycin, 50 mg/L hygromycin B and 1.2% Bacto-agar. EHA101 (pIG121-Hm (sGFP+Aβ)) was grown overnight on LB medium with 50 mg/L kanamycin, 50 mg/L hygromycin, and 1.2 % Bacto-agar at 25ºC. Bacteria were suspended in AAM medium . Rice calli were immersed in AAM medium containing the bacteria for 15 min. Calli were transferred to N6D medium, modified to pH 5.2, containing 100 μM acetosyringone, and incubated in the dark at 22ºC for 3 days. After co-cultivation, calli were washed with the medium (N6 salts, N6 vitamins, 2 mg/L 2,4-D, 30 g/L sucrose, 400 mg/L carbenicillin, pH 5.8). Washed calli were cultured on selective media (N6D medium with 50 mg/L hygromycin B and 400 mg/L carbenicillin) at 25ºC under a 16-h photoperiod. White or yellow calli were transferred every 10 days to the same medium. Calli were transferred to plant regeneration medium  modified with 100 mg/L carbenicillin. Cultures were incubated at 25ºC under a 16-h photoperiod. Calli with green spots or plantlets were transferred every 5-10 days, until the plantlets grew to more than 1 cm in height. Plantlets were transferred into hormone-free MS medium, and fully grown plantlets were planted in soil. Extracted leaf DNA was digested with XbaI. Electrophoresis was performed on 1.0% agarose gels, and DNAs were blotted onto a Hybond-N+ membrane (GE Healthcare) and were subjected to Southern hybridization. GFP sequence containing the whole coding region was used as a probe. Probe labeling and southern hybridization procedures were performed using the AlkPhos direct labeling and detection system with CDP-Star (GE Healthcare). Frozen seeds were crushed. Total protein in one seed (approximately 20 mg) was extracted for 1 h with 400 μL protein extraction buffer (20 mM Tris-HCl (pH 6.5), 8 M urea, 5% 2-mercaptoethanol, 20% glycerol, 4% SDS), and was centrifuged for 10 min at 20,000 × g. Three microliters of each supernatant was applied to Tris-Tricine SDS-PAGE (12% T, 3% C) together with Aβ (human, 1-42) (Peptide Institute) as standards, and the separated protein were transferred to a Hybond-P PVDF membrane (GE Healthcare). The membrane was first incubated in blocking buffer (5% skim milk, T-PBS), and treated with anti-Aβ antibody 6E10 (Signet). The GFP-Aβ fusion protein bound to the membrane was detected using the HRP-conjugated secondary antibody (GE Healthcare) and the ECL plus Western blotting detection system (GE Healthcare). The quantity of brown rice administered to each mouse was adjusted to deliver 10 μg of Aβ. Crushed brown rice was mixed with cholera toxin B (CTB, List Biological Laboratories) (5 μg per mouse) in PBS. C57BL/6J mice (Charles River) were divided into three groups (eight mice per group) and were orally fed with a feeding needle (non-transgenic brown rice, Aβ-containing brown rice (Aβ rice), or boiled Aβ rice). Mice received doses of rice once a week from 8 to 11 weeks of age. As a booster, 0.5 μg of Aβ mixed with Freund's incomplete adjuvant was injected subcutaneously into all mice at 14 weeks of age. Blood serum was collected at 8, 12, 14, and 16 weeks of age. Mice were housed at 25ºC with a 12-h light/dark cycle. All animal procedures were approved by the Animal Care and Use Committee of the National Agricultural Research Center for the Tohoku Region. Micro plate wells were coated with Aβ42 dissolved in 0.15 M ammonium. After washing with PBS-T, wells were blocked with blocking buffer (3% skim milk, PBS), and were washed. Blood serum samples were diluted 10-50 times. Anti-Aβ antibody 6E10 (1 mg/mL) was diluted 10,000-160,000 times as a positive control. Each sample was applied to a well and incubated at 37ºC for 1 h. After washing, each well was blocked at room temperature for 30 min with 3% skim milk and was washed again. Wells were incubated with HRP-conjugated secondary antibody at 37ºC for 1 h and were washed. Wells were incubated with a TMB kit (Pierce) at room temperature in the dark. The reaction was stopped with 2 M sulfuric acid. Absorbance at 450 nm was measured with a spectrophotometer (Infinite F300, Tecan), and antibody titers were calculated (0.1 μg/mL 6E10 = 100 units/mL antibody titer). Aβ (240 ng) was applied to l2% polyacrylamide gels containing 0.l% SDS; separated proteins were transferred to a Hybond-P PVDF membrane. The membrane was first incubated in blocking buffer (ECL Advance blocking agent, GE Healthcare), and treated with serum samples (10 times dilution). Anti-Aβ production was detected by HRP-conjugated secondary antibody and the ECL advance Western blotting detection kit (GE Healthcare). Initially, the luminescence of transgenic rice expressing the EGFP-Aβ fusion gene was weak. The sGFP(S65T) gene is designed for plant use and gives brighter light in the plant than the original GFP . 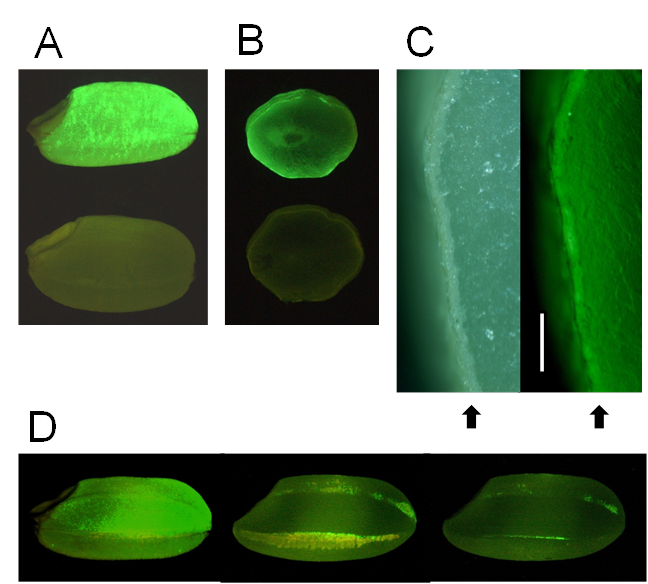 We therefore expressed sGFP instead of EGFP in rice, and the resulting transgenic rice seeds exhibited stronger luminescence with many fluorescent spots (Fig. 1A, B). Fluorescence was localized mainly in the aleurone layer of brown rice (Fig. 1C). Polished rice had a little fluorescence (Fig. 1D). These results show that Aβ accumulates in aleurone layer, and if brown rice is polished, a proportion of Aβ is removed from the rice. Most rice eaten in Japan is polished, and brown (non-polished) rice must be eaten for AD vaccination to succeed. 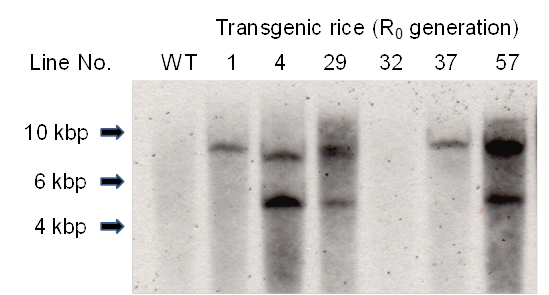 The presence of the Aβ-GFP gene in the leaves of primary transgenic rice plants (R0 rice plants) was investigated by PCR analysis using primers sGFP-5'-XbaI and Aβ-3'-SacII (data not shown). In samples where PCR analysis indicated the presence of the Aβ-GFP gene, Southern blot analysis was used to confirm transformation in individual plants (Fig. 2). The Aβ-GFP gene was introduced into R0 plants except line No. 32. The positive PCR result in the Line No. 32 plant may have been due to residual Agrobacterium in plant tissue. Western blotting was used to investigate the accumulation of the Aβ-GFP fusion protein in Aβ transgenic rice (Fig. 3). The signal intensity of the band was compared against the signal intensity of Aβ42 as a control, and differences were observed among lines. The highest concentration, 8 μg of Aβ in a single grain of brown rice (400 μg/g brown rice) was found in samples from line 29, compared with 18-50 μg Aβ  and 77 μg Aβ  per gram of soluble protein found in potato in previous studies. Immunogenicity of Aβ rice was assessed by feeding brown Aβ rice to C57BL/6J mice, from 8 to 11 weeks of age, and assessing serum anti-Aβ antibody titer by ELISA (Fig. 4). At 12 weeks age, we observed a significant increase in serum anti-Aβ antibody titer in mice fed boiled Aβ rice; the increase was not significant in mice fed uncooked Aβ rice. Anti-Aβ antibody was also detected by Western blot analysis in mice fed Aβ rice (Fig. 4B). No increase of anti-Aβ antibody titer was detected in mice at 14 weeks of age, three weeks after the last oral administration (Fig. 4C); but the anti-Aβ antibody titer significantly increased again at 16 weeks of age, after a subcutaneous booster injection (Fig. 4D). Detection of GFP fluorescence in seeds (brown rice). (A) Transgenic brown rice (upper seed) and non-transgenic brown rice (lower seed). (B) Transverse sections of transgenic brown rice (upper seed) and non-transgenic brown rice (lower seed). (C) Aleurone layer in transverse section of transgenic brown rice. Right panel shows fluorescence view. Bar indicates 200 μm. Arrows show aleurone layer. (D) Effects of polishing transgenic brown rice: non-polished rice (left seed, weight: 21.3 mg), the roughly polished rice (middle seed), and the polished rice (right seed, weight: 19.1 mg, rice-polishing rate: 89.3%). The yellow region of roughly polished rice is bran layer. A fluorescence stereo-microscope (Nikon SMZ800) was used to observe GFP fluorescence. Southern blot analysis of Xba I-digested total DNA probed for GFP-specific genes. WT, non-transgenic rice plant: R0, primary transgenic rice plant. Determination of Aβ42 expression levels. Brown rice samples were subjected to SDS-PAGE with Aβ42 at increasing concentration (5, 10, 20, 40 and 60 ng). Approximately 0.15 mg of crushed seeds was applied to each lane. R0 seeds (R1 generation) and R1 seeds (R2 generation) were used. WT; non-transgenic rice; R1, R0 progeny; R2, R1 progeny. Faint band in WT is non-specific band just below Aβ42 band. Titers of antibodies against Aβ in serum from 8-week-old mice before immunization (A), 12-week-old and 14-week-old mice after immunization (B, C, each), and 16-week-old mice after booster injection (D). Anti-Aβ antibody titers for each mouse are shown. Horizontal lines show average. * P < 0.05 vs. control. Data were compared by t-test after logarithmic conversion. Antibody production evaluated by Western blot analysis (B). For each group, four serum samples with highest anti-Aβ antibody titers were mixed and used for Western blot analysis. The increase of anti-Aβ antibody titer after booster injection shows the presence of anti-Aβ antibody response in mice fed uncooked Aβ rice or boiled Aβ rice. However, the increase in anti-Aβ antibody titer at 12 weeks of age shows the booster injection was not necessary for Aβ oral immunization. In a previous study using green pepper containing Aβ , we examined the effect on anti-Aβ antibody titers of orally immunized mice and subcutaneously immunized mice over a long-term (12.5 months) trial. The increases in anti-Aβ antibody titer of orally immunized mice were similar to increases in injected mice. 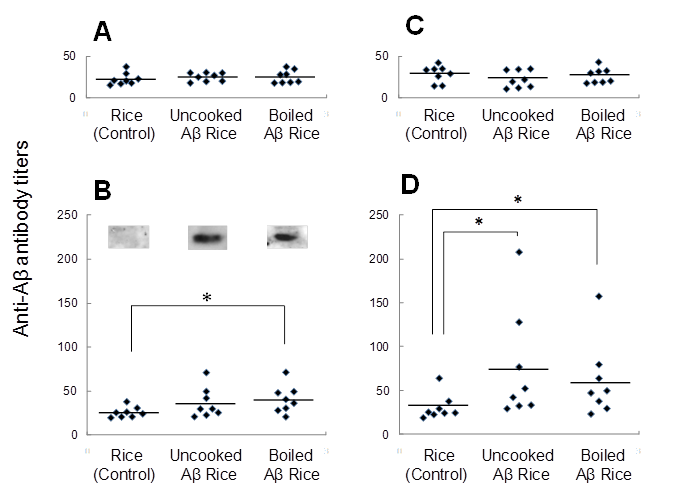 In the present study, the increases in anti-Aβ antibody titers of mice fed Aβ rice were not as great as those observed in mice given a booster injection. The difference between the studies may arise from the differences in the period of antigen administration. Further, even if an antibody response is weak, Aβ in mice brains may be removed by long-term immunization of the AD mouse models . Taken together, we conclude that long-term oral administration of Aβ rice without Aβ injection can prevent and treat AD in mice. In general, the immunological effect after oral-intestinal mucosal immunization tends to be weak, and this method may induce immunological tolerance. Oral immunological tolerance can be suppressed by the use of specific adjuvants. Bacterial toxin, such as CTB, is often used as an adjuvant in oral immunization of mice. Although CTB may not be highly toxic, there may be some clinical side effects. A safer adjuvant might be developed from plants that produce compounds such as saponin  and it may be feasible to develop adjuvant-free oral vaccine from plants. Further animal study is necessary to determine the effectiveness of adjuvant-free Aβ rice for AD. In a previous study, we developed a technique in which a plant (green pepper) was infected with a plant virus, causing Aβ to accumulate within the plant . Mice that were orally administered Aβ-containing plant tissue showed lower levels of serum IgG2a, an inflammatory Th1 immunological globulin, than mice in which the vaccine was administered by injection . These results indicate that the plant-derived vaccine is safe and effective. In addition, vaccines made using plants are far safer than vaccines from animal cells or microbes as there is less danger of the vaccine being adulterated with prion proteins, pathogenic viruses, or bacterial toxins. Thus, plant-derived vaccines require less purification, and may be produced cheaply. The rice cultivar 'Hayayuki' used in this study is an early-ripening variety that can be harvested approximately 3 months after planting. Moreover, its compact form allows year-round production in a greenhouse or plant factory so that transgenic rice would be easily contained. The additional cost of contained production is likely to be justified by a high added-value product, such as a remedy for AD. In the present study, we showed that oral administration of Aβ rice to mice elevated serum Anti-Aβ antibody titer. We previously found oral administration of Aβ green pepper to Tg2576 mouse models elevated serum Anti-Aβ antibody titer and reduced senile plaques; and that there was an inverse correlation between anti-Aβ antibody titers and soluble intracerebral Aβ . It is likely that accumulation of Aβ in the brain can be suppressed by administering Aβ rice. We plan a further experiment with AD mouse models to investigate whether oral immunization by long-term administration of Aβ rice decreases senile plaques. Rice is commonly eaten in grain form without first being pulverized. This would make it easy to control intake, as with medicines in pill form. In addition, where rice is eaten as a staple, it is possible to ensure regular intake. In the present study, we showed that boiled Aβ rice does not reduce the efficacy of the vaccine, thereby allowing its use as an edible vaccine. The ease of use of an Aβ rice vaccine for AD makes this the most attractive vaccine for preventing and treating the disease. We would like to thank Dr. S. Hidaka and Dr. N. Yamagishi for valuable advice. This work was supported in part by funding for Research for Promoting Technological Seeds from the Japan Science and Technology Agency.